MacDonald P. Jackson: Determining the Shakespeare Canon. Arden of Favers - ham and A Lovers Complaint. Determining the Shakespeare Canon devotes five chapters to the anonymous domestic tragedy, Arden of Faversham, and five to the short narrative poem, A Lovers Complaint. In the opening chapter, Jackson provides an insightful analysis of Ardens quarrel scene and the intricacies involved in Mosbys monologue. He puts forth a convincing argument that, on the basis of external evidence, Arden is just as strong a contender for admission into Shakespeares canon as Edward III, which is now generally accepted as an early Shakespearean collaboration. However, given the equal portions devoted to two texts of such disparate lengths, it seems unlikely that Jackson has pro - vided enough internal evidence, within 126 pages, to convince sceptics that the middle portion of Arden should be admitted into Shakespeares canon. Jackson notes that Apart from Shakespeare, the main contenders for the plays authorship are Thomas Kyd and Christopher Marlowe [p. 15]. Jackson cites Brian Vickerss attribution to Kyd frequently, but his assertion that Vickers is wrong relies on his belief that no scholar has discovered as many links with Kyd (as with Shakespeare) for the plays authorship. 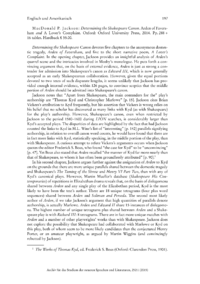 However, Shakespeares canon, even when restricted by Jackson to the period 15801600 during LION searches, is considerably larger than Kyds accepted plays.